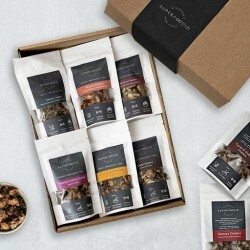 Artisan snacks to delight, nourish and satisfy made using unique ingredient combinations. Nirali & Jag made the decision to park the daily grind and see more of the world. Being vegetarian and passionate about healthy eating, they discovered a wide choice of exceptionally nutritious and local native new superfoods during their travels across the South America. Superfoodio was born out of their desire to bring their newfound food passion home and share it with all of you foodies out there. They do this by creating artisan snacks that have a delightful twist.